This 375MM was born with Pinin Farina Spyder coachwork but was bashed and bruised by its first owner. Returned to Ferrari in 1954, it was sent to Scaglietti, whose craftsmanship and sparse and efficient bodies would shortly grace all competition (and most production) Ferraris, for fresh covering. The flowing contours of Testa Rossas and SWB Berlinettas first appeared here. 0366 AM isn’t a Testa Rossa, but looking through the car its message is loud and clear: this is the shape of things to come. 340hp 4,522cc. 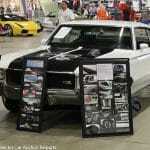 single overhead camshaft V12 engine, 4-speed manual transmission, 4-wheel drum brakes. Wheelbase 2,600mm (102.3″). 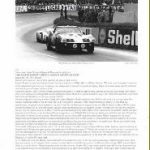 While Ferrari’s focus was always on Grand Prix victories, he was never reluctant to apply the lessons learned in Grands Prix, or to spread out the high cost of GP car and engine development, to big hairy-chested sports cars. 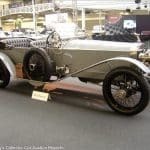 Sports cars also earned both starting and prize money for the factory and there seemed to be a constant queue of sports-racer customers, waving dollars, lira, francs, pounds and pesos, standing outside the factory gate. The 375 Mille Miglia descended directly from the 4½ liter GP formula and the big engine which Aurelio Lampredi designed for it. Successful from inception, it was natural to tune the engine down a little, adapt Ferrari’s typical two-tube frame and solid rear axle suspension, wrap a 2-seat body around it and go collect some more starting and prize money and sell some cars to keep the Scuderia in operation. Typically bodied by Pinin Farina, the 375MM was both the factory’s team car and a favorite of well-heeled customers. 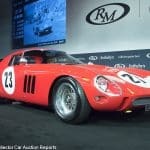 One of them, Casimiro de Oliveira, so frequently battered his 375MM’s Pinin Farina body that it had to be returned to Ferrari after only a year where it received a very early body by Scaglietti, 0366AM, the 375MM offered here. 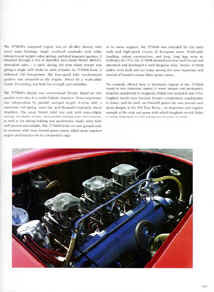 The 375MM’s Lampredi engine was an all-alloy beauty with seven main bearings, single overhead camshafts with roller followers and hairpin valve springs and dual magneto ignition. It breathed through a trio of beautiful 4-choke Weber 40IF4/C downdraft carbs, a rare instance at the time of Ferrari giving a single carb choke to each cylinder. In 375MM form it delivered 340 horsepower. 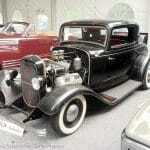 The four-speed fully synchronized gearbox was mounted to the engine, driven by a multi-plate clutch. Everything was built for strength and reliability. The 375MM’s chassis was conventional Ferrari, based on two parallel oval tubes in a welded ladder structure. Front suspension was independent by parallel unequal length A-arms with a transverse leaf spring, sway bar and Houdaille hydraulic shock absorbers. The usual Ferrari solid rear axle with semi-elliptic springs, Houdaille shocks and parallel trailing arms (for location and taking braking and acceleration loads) was both well-proven and reliable. The 375MM broke no new ground and in common with most Ferrari sports-racers relied upon superior engine performance for its competitive edge. As its name suggests, the 375MM was intended for the open roads and high speed circuits of European races. Predictable handling, robust construction and long, long legs were its attributes. 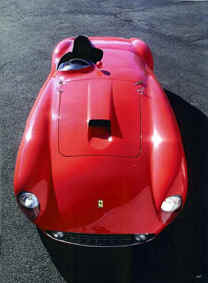 The 375MM showed just how well Ferrari had conceived and developed it, winning frequently in 1953. Twelve 375MM spiders were built and are today among the most important and coveted of Ferrari’s classic Fifties sports-racers. The example offered here is absolutely typical of the 375MM except in one important aspect: it wears unique and particularly attractive coachwork by Scaglietti which was created in late 1954. 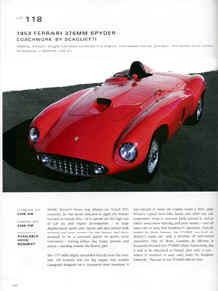 Scaglietti would soon become Ferrari’s competition coachbuilder of choice, and the body on 0366AM points the way toward such classic designs as the 250 Testa Rossa, an important and singular example of the style and grace with which Scaglietti would clothe so many important Ferrari racing cars in years to come. 0366AM was first delivered on December 20, 1953 to Casimiro de Oliveira of Portugal at the 12 Hours of Casablanca where the new owner was to drive with the World Champion Alberto Ascari. Ascari qualified 0366AM for the race but de Oliveira crashed his new car in practice and it did not compete in the race. Ascari must have been particularly annoyed when the race was won by Giuseppe Farina and Piero Scotti in another 375MM. In May 1954 de Oliveira placed 0366AM seventh in the Hedemora Grand Prix in Sweden which was to be the best placing in his ownership of the car. He failed to finish both the Porto GP in June and the Grand Prix of Portugal at Monsanto in July, then agreed to sell 0366AM to Swedish Ferrari importer Tore Bjurström for Valdemar Stener to drive. De Oliveira delivered Bjurström’s new 375MM at a race at the Skärpnack airfield – and promptly crashed it again. 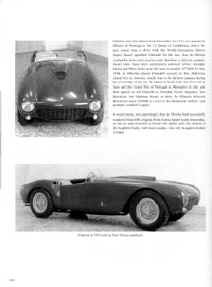 It would seem, not surprisingly, that de Oliveira had successfully rendered 0366AM’s original Pinin Farina Spider body unrepairable, so the car was returned to Ferrari for repairs and the Scaglietti body it still wears today, the only Scaglietti-bodied 375MM. Despite the long hood dictated by the Lampredi engine and the 2,600mm wheelbase, almost 10″ longer than the later 250TR, Scaglietti succeeded in creating an harmonious entity that complements the 375MM’s loud and powerful engine with a delicacy lacking in other sports-racers’ coachwork of the period. Gracefully rounded fenders and extended front wheel wells to help cool Ferrari’s drum brakes hint at the styling evolution which had already begun with this car, while the head-fairing and small windscreen define its purpose and accentuate the driver’s intimate involvement with it. It was for the time an exceptional achievement and remains today a recognized milestone in the history of Ferrari sports-racing car bodies. Returned to Bjurström and Stener in early 1955 it finished second in the Swedish Grands Prix in 1955 and 1956 – although Stener also crashed 0366AM in the 1955 Helsinki GP. 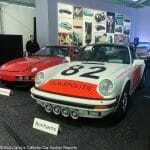 It remained in Sweden for many years, finally being restored in 1977 by Graypaul Motors in England after which it was owned by Nick Harley and then Lord Brocket in the UK. It was sold in 1993 to Charles T. Wegner who drove it in the Mille Miglia that year, then brought it to the US. Sold subsequently to Stan Zagorski, it was later sold to Giuseppe Calgaro in Italy. 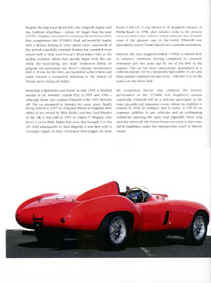 Purchased from Calgaro by Scott Rosen in the US, it was shown in the Scaglietti category at Pebble Beach in 1998 after which it went via Chris Cox to the present owner, via Chris Cox to the present owner, an East Coast collector through whose collection some of the greatest cars in the world have passed. 0366AM was immediately sent to Frank Triarsi’s Classic Coach Repair in Elizabeth, NJ for cosmetic restoration. 0366AM, the only Scaglietti-bodied 375MM, is offered here still in concours condition, cosmetically restored two years ago by one of the best in the business and meticulously maintained in a collection known for the consistently high caliber of its cars and their constant readiness for any event, whether it is on the road or the show field. An exceptional Ferrari which combines the brawny performance of the 375MM with Scaglietti’s unique coachwork, 0366AM will be a welcome participant at the most enjoyable and important events where its eligibility is ensured by both its pedigree and its rarity. 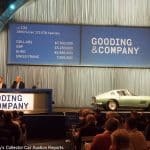 It will be an important addition to any collection and an exhilarating vehicle for enjoying the open road, especially those long stretches where all 340 Ferrari horses can romp as they once did in Casablanca under the Championship touch of Alberto Ascari. Click here to return to the auction catalog descriptions index.